We ride as group, but not in a pace-line or peloton, except occasionally on the fast rides. Once we're out in the open, on quiet roads, we can ride side-by-side: the social aspect of the social rides! 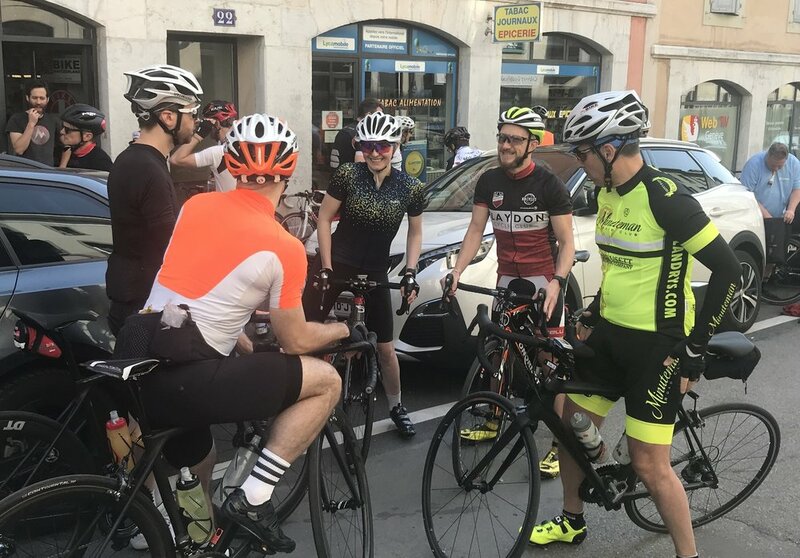 The itineraries are posted a few days prior to the ride; we recommend you look at them and familiarize yourself with the overall route, so there are no surprises. At yield/stop signs, the guide will shout "clear" when it is safe to cross; but this applies only to the riders close to the front - if you're further back, it is up to you to check there is no cross traffic before proceeding. At traffic lights, the group will proceed when it turns green; if you are further back and the light turns red, stop - the rest of the group will wait for you. We ride single-file on busy roads, and side-by-side on quieter roads. But the guide will shout "Car up," and the person in the rear will shout "Car back" when a car approaches - this is the signal to resume single-file riding. The guide will use hand signals to indicate turns, slowing/stopping, debris etc. (Click here for basic hand signals - new tab). If the group is fairly large, we expect riders in the middle of the group to repeat the hand signals for those who are further back. For large groups, the guide will assign a "sweeper," a fast rider who knows the route; s/he will stay in back, and help anyone who is falling behind, often due to mechanical difficulties.